These are such things as dreams are made on, the colorful concepts of dying developers, the universes that will never be. 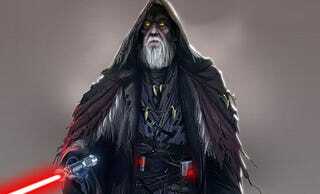 A recent glimpse into the unpublished works of a now-defunct game developer shows us one such universe which includes fabled Star Wars good guy Obi-Wan Kenobi, corrupted and evil. In the original concept art for the unannounced, but long-rumored-to-exist video game Star Wars Battlefront III, we get a chance to wonder what could have been had Obi-Wan Kenobi fallen to the temptations of the Dark Side. Oh man, oh man, oh man. This has got to be the coolest looking Obi-Wan Kenobi I&apos;ve ever seen. The images, leaked by a former developer at Free Radical, show a yellow-eyed, hunched form in the tattered remnants of the robe made famous by Alec Guinness. His hands are gnarled and claw-like, his light saber not a heroic blue, but a malignant red. Traditionally, George Lucas has always approved any change to Star Wars canon, though it's unclear if this rumored idea would have changed canon or created a new one. But it does make this particular tidbit far more interesting than your average leaked game designs. Maybe Lucas is playing around with the idea of flipping his beloved, Wookiee-packed universe on its head. While UK-based Free Radical certainly isn't the only game developer on the chopping block thanks to a wobbly world-wide economy, the video game industry as a whole seems to be relatively healthy. In 2008 the industry raked in an estimated $21.3 billion dollars in the U.S. alone, according to the latest numbers released by the NPD Group this week. That's more than double the take of the industry back in 2005, when it was barely scratching at $10.5 billion's door. Where did all of that dough come from? According to the numbers, the industry has Nintendo to thank for the lucre. Selling more than 10 million Wii consoles and nearly 10 million DS, not to mention 132 million games for their systems, in 2008, the Japanese developer is responsible for more than half of all gaming sales last year. What are they going to do with all of that money? Continue to experiment it looks like. Word is already starting to shake loose that the DSi, the company's two-camera, one microphone version of the handheld DS, could be hitting U.S. shores as early as April for $180. More interesting, though, is Nintendo's valiant attempt at pushing the educational side of gaming with their devices. In recent months Nintendo has approved a number of educational games for their systems including one meant to help study for the SATs and another for practicing math. On Tuesday, the developer announced a partnership with The National Association for Music Education aimed at using Nintendo's Wii and Wii Music in classrooms to teach children about rhythm, tempo and song structure. "Research shows that more than 82 percent of people who don't currently play a musical instrument wish they did," said Joe Lamond, President & CEO of NAMM, the National Association of Music Merchants. "Wii Music can help address this by providing a positive introduction for millions of people who might not otherwise be inclined to try."